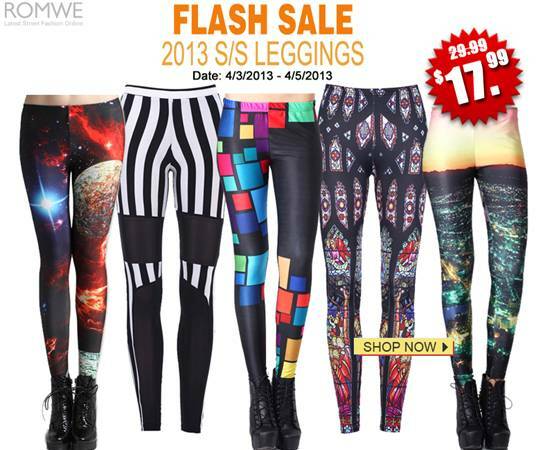 Just had to pop up a quick post about this awesome flash sale Romwe is having on their new SS13 Leggings. Lately I've been obsessing over Romwe and their awesome graphic leggings, predominantly this pair adorned in Super Mario, and this amazing Angry Birds print. They also have the usual galaxy leggings, unusual religious prints and even The Simpsons-themed leggings. I love getting creative with fashion and I think these are the perfect way of doing so. And guess what?! From April 3rd-April 5th (72 hours only!) they are reducing their leggings from $29.99 to $17.99. That's from around £20 to £11.80 - BARGAIN. I am most certainly going to be taking advantage of this sale - it's going to be very difficult to stop me buying one of every pair! Have you got your eye on any of the amazing leggings from Romwe? You have the perfect excuse to buy a pair!